Southside High School graduate Beck Williams is one of four University of Arkansas students in the 2018-19 school year to receive the prestigious Sturgis Fellowship through the J. William Fulbright College of Arts and Sciences at the University of Arkansas. The fellowship, which began in 1985, awards each fellow $72,000 over four years, covering tuition, room and board, support for computer hardware and software, musical instruments, professional journals and participation at academic conferences. Sturgis Fellows are also asked to study abroad. The university did not have immediately available stats going back to 1985, but since 2008 Williams is one of only two students from the Fort Smith Public School District to be named a Sturgis Fellow. The three other students receiving the fellowship in this school year are Mia Alshami of Pulaski Academy in Little Rock, Josie Carson from Lake Hamilton High School, and Sarkis Kalajyan from the Arkansas School for Mathematics, Sciences and the Arts in Hot Springs. Williams is a National Merit Finalist and a National AP Scholar. He is an Eagle Scout and member of Boy Scout Troop 3 of Fort Smith. He was vice president of his class for three years, president of the Southside Maverick Band, and trombone section leader during his senior year. 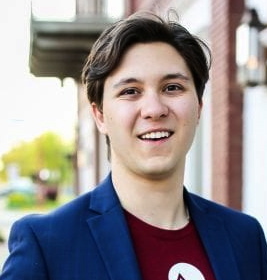 He is an alumnus of the Fort Smith Junior Leadership Academy, was a volunteer soccer coach for seven-year-olds and volunteered with a local political campaign. He plans to double major in political science and mathematics, with a focus on statistics. His parents are Nancy and Bruce Perkinson. Beck told Talk Business & Politics he first found out at the beginning of spring break in March he had been named a Sturgis Fellow. He was playing disc golf with friends when he got the e-mail. He said the application process began in the fall of 2017 and he was notified in mid February he would be one of nine to interview for Sturgis. The interviews were held the first weekend in March, but first he had to complete an online timed essay. The subject he selected on which to write was about the biggest present threat to the U.S., and why. “I said it was Russia, because they are creating a lot of division from the outside as a world power, and they are also divisive in our own country in dealing with our elections,” Williams said. Four faculty members conducted the interview, and most questions were about his essay, Williams said, adding that he also talked about Alexander Hamilton and Henry Clay, two of his favorite subjects in American political history. According to the UA, Sturgis Fellows have won Rhodes, Marshall, Truman, Gates Cambridge, Goldwater and Fulbright Scholarships. Their undergraduate study abroad experiences have included programs in Japan, England, India, South Africa, Ghana, Rwanda, China, Russia, Italy, Germany, Austria, Australia, Scotland, Ireland and Spain. The Sturgis Fellowship was created with an original endowment of $2 million from the Dallas-based Roy and Christine Sturgis Charitable and Educational Trust. The endowment would eventually grow to $10 million. “With only 16-20 Sturgis Fellows on campus at any given time, each receives the kind of individual attention from the director, associate director and staff of the Fulbright College Honors Program that delivers a memorable and productive college experience,” according to the UA.